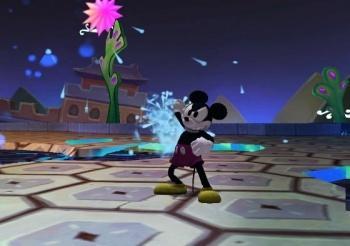 Epic Mickey mastermind Warren Spector says the game is faring so poorly with reviewers because they just don't understand what it is they're playing. So, Epic Mickey. It really hasn't lived up to the pre-release hype. It scored a wan 3/5 stars here at The Escapist and a comparably sickly 60 at Eurogamer and GameSpot; many reviewers praised the cleverness of the concept but took it to task for the decidedly sub-par gameplay. But in an interview for MTV's Clutch blog, reprinted in full at The Examiner, Spector, the driving force behind the game, said the real problem is that reviewers just don't get it. "There has never been a game, ever, where if you give it to me for 30 seconds, I can't break it. I mean, I will break a camera in any game ever made," he said in response to criticism about the game's camera view. "Third person camera is way harder than I even imagined it could be. It is the hardest problem in videogame development I now believe. So it is a hard problem, everybody gets it wrong, it's a question of how close to right do you get it." "Second, cameras are different in different game styles," he continued. "So in a platform game, you want the camera up higher in a steeper angle, because the important thing for the platform player is to be able to see the next jump clearly, to see the gap. In an action adventure game, like a Zelda for example, you want the camera down lower so you have more tactical awareness because there are enemies out there... So platformers and action adventure games have different camera requirements." The problem, he explained, is that Epic Mickey is an "action adventure role-playing" game, yet everyone including members of his own team insists on judging it as a platformer. Spector said the comparisons with Super Mario Galaxy 2 are "driving him crazy" because, as a dedicated platformer, it's naturally going to be better at it and have a better platform-style camera. "I will go to my grave, imperfect as it is, proud as hell of my camera team," he said. "And if reviewers want to give us a hard time about it because they're misunderstanding the game we made, it's not for me to tell them that they're wrong, absolutely not. But I wish people would get it out of their head that we made a Mario competitor, because we didn't." I have boundless respect for Warren Spector - you could substitute his dev credits with a "Top Ten Best Videogames of All Time" list and nobody would bat an eye - but in this case I have to disagree with his assessment. If a large number of experienced reviewers are somehow "doing it wrong," that speaks to a fault in the game, not in the understanding of the player. Misunderstanding a tricky mechanic or arcane rule is one thing, but "misunderstanding the game we made" just doesn't hold water.